Teaching a large-lecture course requires a higher level of practical and pedagogical organization than a small-lecture course, so it is crucial to prepare as much as possible before the first day of class. While CTL’s resource page on course design contains recommendations that apply to courses of any size, large lecture instruction presents several unique challenges. The “Engaging Students in Large Classes: High Tech and Low Tech Strategies” learning community was convened winter quarter 2014 to consider these challenges. 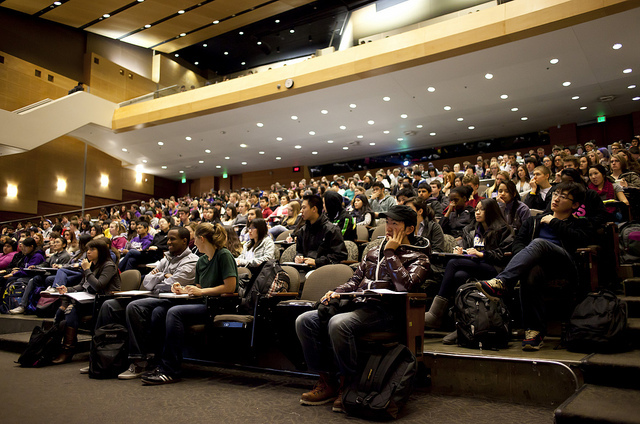 Participants comprised a diverse collection of UW faculty and staff with a variety of experiences in large-lecture instruction. In addition, several instructors who had developed creative approaches to large classes were invited to discuss their innovations with the community. Design around brief, meaningful and concrete learning goals. You will need to communicate and work with them with many students. Develop a comprehensive syllabus and do not deviate from it. Every change you make after the syllabus is published is an opportunity for misunderstanding multiplied by 100+ students. Clearly communicate to TAs and students with premeditated messages. Building messages in advance gives you time to make sure they are clear and unambiguous. Humanize yourself and your subject matter to students. Large classes can create distance and division between students and teachers. Encourage active learning and productive struggle. Studies have shown that requiring students to be active participants in the creation of knowledge, rather than passive receivers, improves learning outcomes. Keep innovation simple and limited. The logistical complexity of implementing innovative teaching strategies in a large lecture is much greater than in a small class. Strive, plan and provide opportunities to include everyone. Large classes multiply the opportunities for people to be left out. Make sure your assessments support your learning goals. The more closely assessments track learning goals, the more easily students will understand their purpose.